This week’s holiday: Guess. I am amazed at the spontaneous descriptions and discussions on journals and weblogs and chat rooms. There’s much more than last year. This begs the question of whether journals/blogs are ‘private’ or ‘public’ texts, and whether they have already evolved newsmedia-type conventions like A Holiday Is A News Peg. Favorite comment so far is Patrick: “Nobody does patriotism like New Englanders.” Me, I ate a makkara but it just wasn’t the same. PS 2015: That was when the Internet was whelming but not overwhelming. Of course, holidays have long been a peg for private correspondence: cards particularly. Patrick is still a go-to person in my intersphere for the pithy comment. This week’s holiday is midsummer. It happened last week, but I’m still feeling the effects. Those of you who were there know which ones. This week’s national independence day: Iceland. See it here and here. And I was blogged back here. 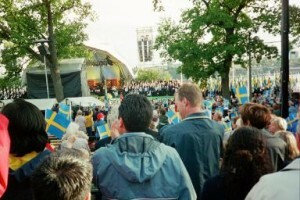 Last week’s national day: Svenska flaggans dag. And I was there at Skansen. Didn’t manage to spot the Royals; too much sound equipment between them and me. Vicky was apparently in the United States or Finland. Carl Philip the pinup prince is doing his army service. But pikkuprincessan Madeleine was there with the kongsparet and the press were salivating over her upcoming 18th birthday, since once she’s an adult they will be able to take the gloves off and start stalking her on dates. Everyone enjoyed Alice Bah’s speech and the rock concert that was embedded in the program, in between the various flag routines. PS 2015: This is still the closest I’ve ever gotten to Allsång på Skansen. One day. Stockholm i mitt hjärta! National holiday of the week: Israeli Independence Day. Not until I moved to Finland did I learn that it’s celebrated in Jewish communities around the world. The festivities here included a religious service, a musical programme (a girl playing Sibelius on the piano, a group of teenagers who just won the Jewish Eurovision singing original Israeli pop songs, and the same little girls doing breakdancing who can be seen at every Finnish public occasion including the veterans’ gatherings on December 6), delicious Middle Eastern food, and folk dancing. Related readings: Public Culture (a forthcoming issue will include a natural history of the passport) and anything by Don Handelman, whom I think I will adopt as a personal guru.